Since SYHA was established more than 87 years ago, its logo has remained more or less unchanged. Despite being widely recognised and having a strong heritage, market research revealed that the younger population didn’t connect with it. 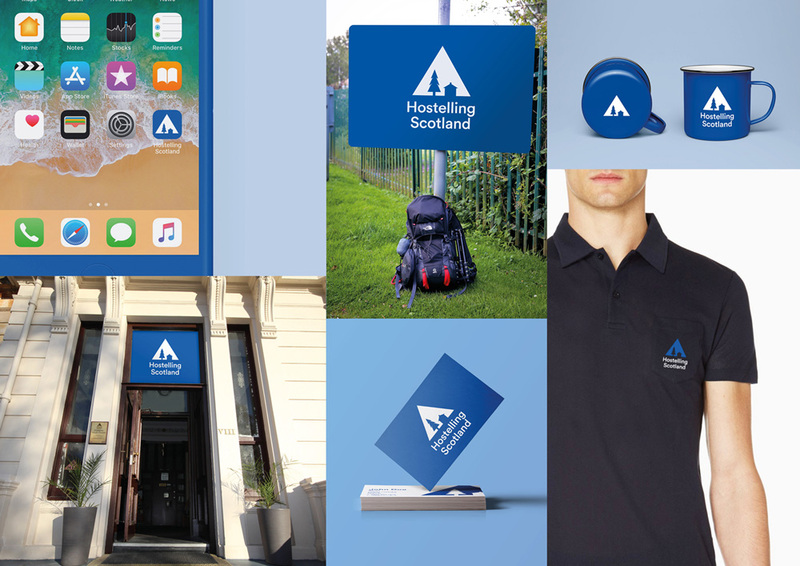 A rebrand was needed to ensure SYHA remained attractive for all and continued to be recognised as the modern face of Scottish hostelling. 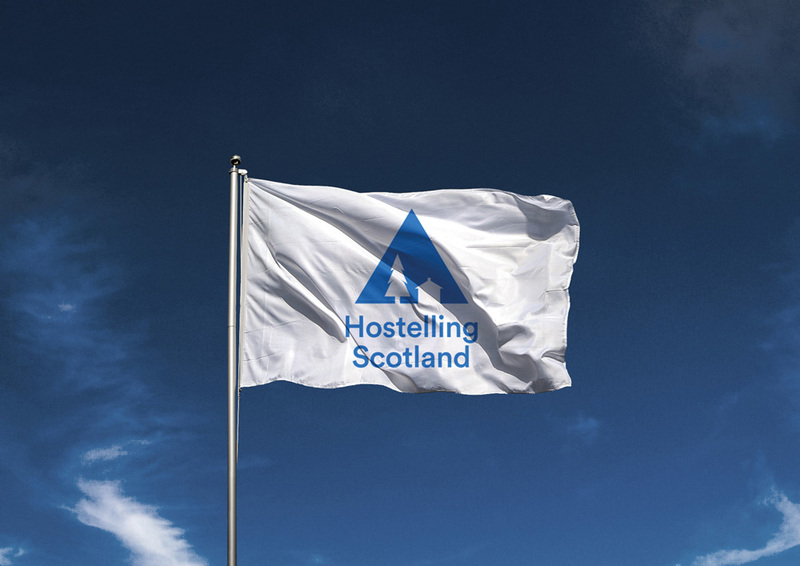 Our solution was to replace a nationally recognised hostelling symbol with an internationally recognised one, but with a Scottish twist. 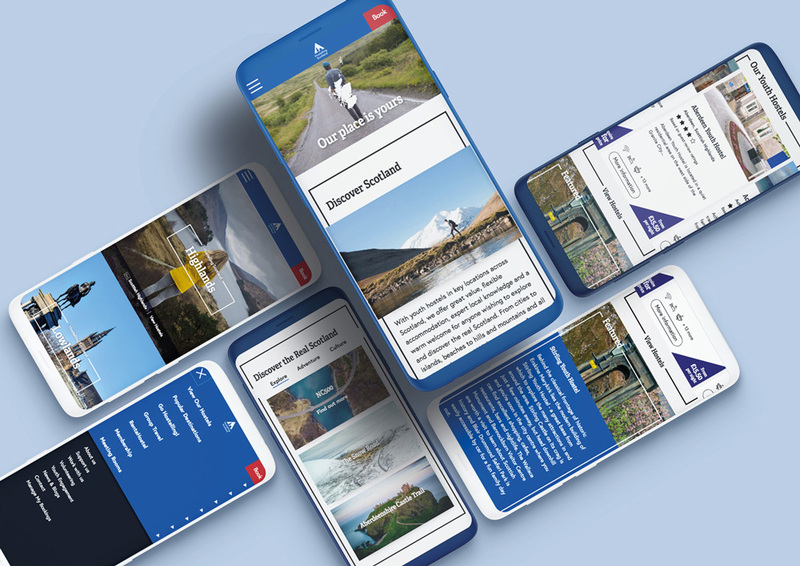 The new brand firmly cemented SYHA as a Scottish institution, providing unique access to the beautiful landscapes and bustling cities of a country alive with culture, community, heritage and experiences you won’t find anywhere else. Canada and U.S. versions (not designed by Frame) along with Scotland version. Parent organization Hostelling International logo. Banners. This moment where the Hostelling Scotland and Hostelling International logos meet gives me shivers. The old logo wasn’t necessarily good but it was so bold and busy that it sort of had a good thing going, in a Brutalist-logo kind of way. With the new logo, it took me a few minutes to sort this out based on the text provided… So, Hostelling Scotland is part of Hostelling International (HI) which manages hostel associations around the world… HI has a triangle logo with a tree and a house in it, which Hostelling Scotland has adopted and modified, which I guess is fine… but the logo is being presented as if it was originally conceived to come from the Scottish flag… which it wasn’t… it just happens that the HI’s logo can be retrofitted to match that concept… which is a weird thing to do… which would be fine if the original logo at least was great but it isn’t. It’s a sad tree and a dopey house awkwardly sitting inside a triangle. 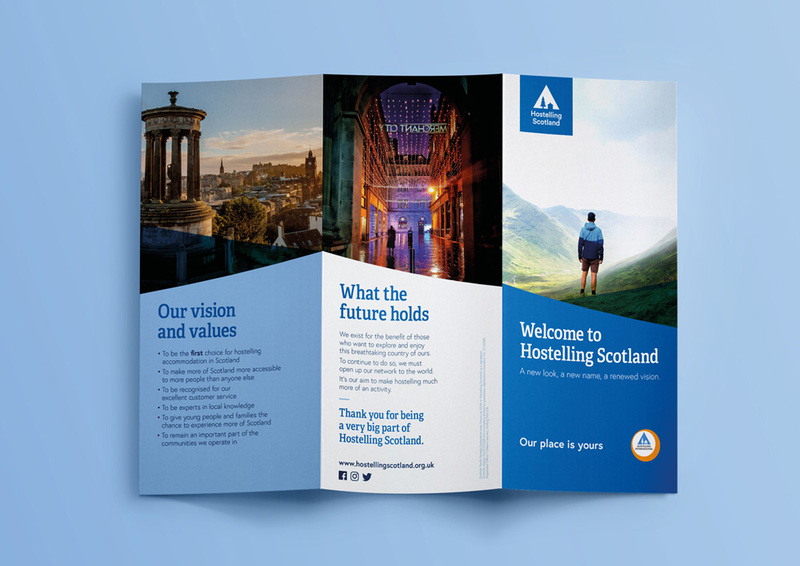 Hostelling Scotland’s logo doesn’t improve the logo in any significant way and, worse, it simply adds to the baffling inconsistency across the logos that each country associated with HI uses. The organization that really needs a rebranding and re-figuring is HI. This post turned out a lot different in the end than before I started writing it. 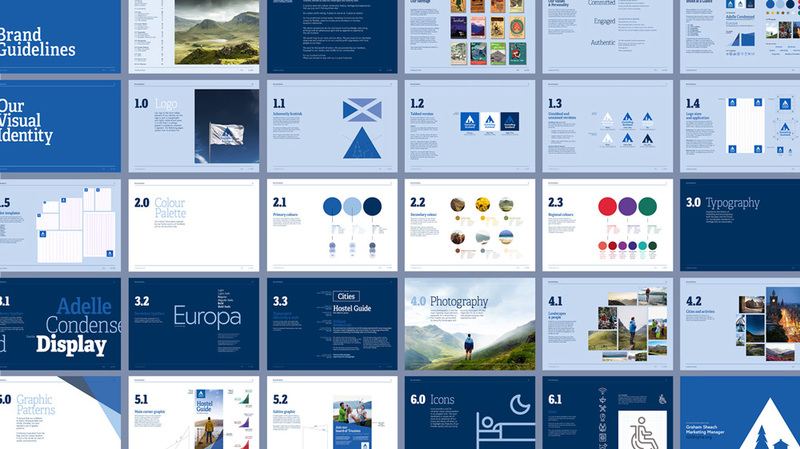 Back to Hostelling Scotland… the applications are fine but mostly kind of shy and bland. The introduction of a condensed sans serif as the primary typeface feels random and clashes with the logo. There are some angles at play but, eh, not too convincing. Overall, this isn’t very exciting or cohesive or even clarifying about what place Hostelling Scotland occupies. (Est. 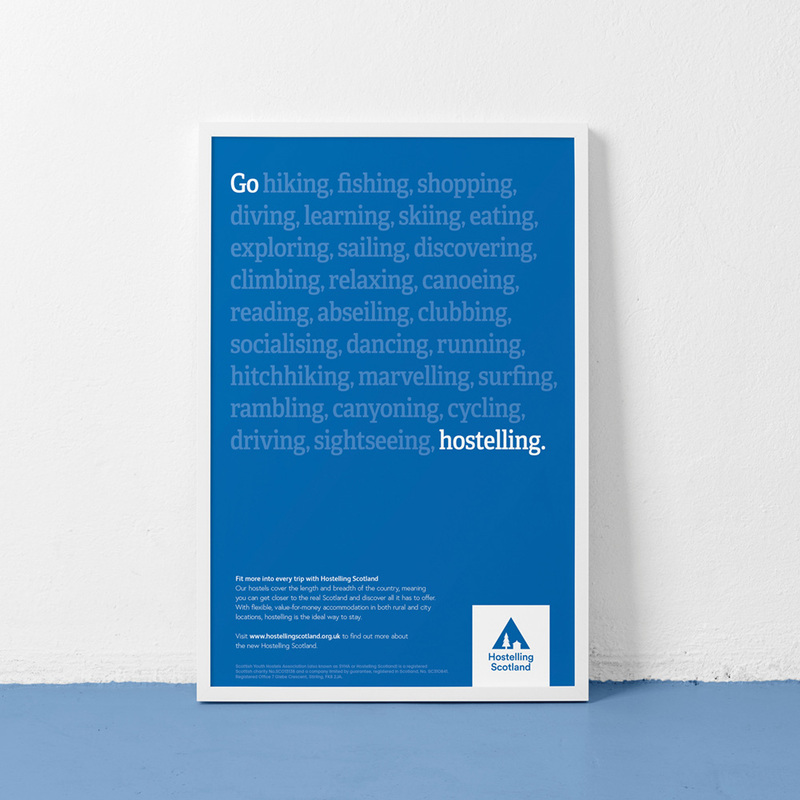 1931, previously Scottish Youth Hostels Association) \"Hostelling Scotland is a not-for-profit charity with over 60 youth and affiliate hostels. 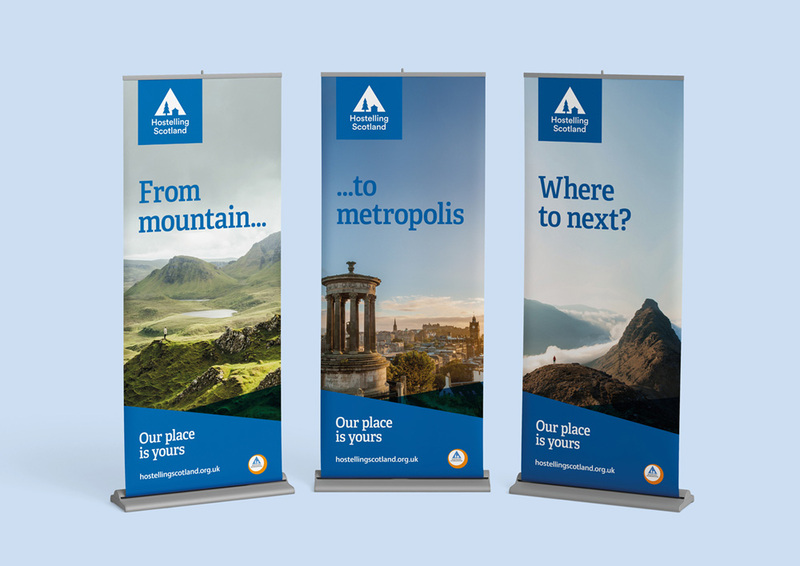 Since 1931, we have welcomed visitors from all over the world, providing affordable, welcoming accommodation in some of the best locations across Scotland. 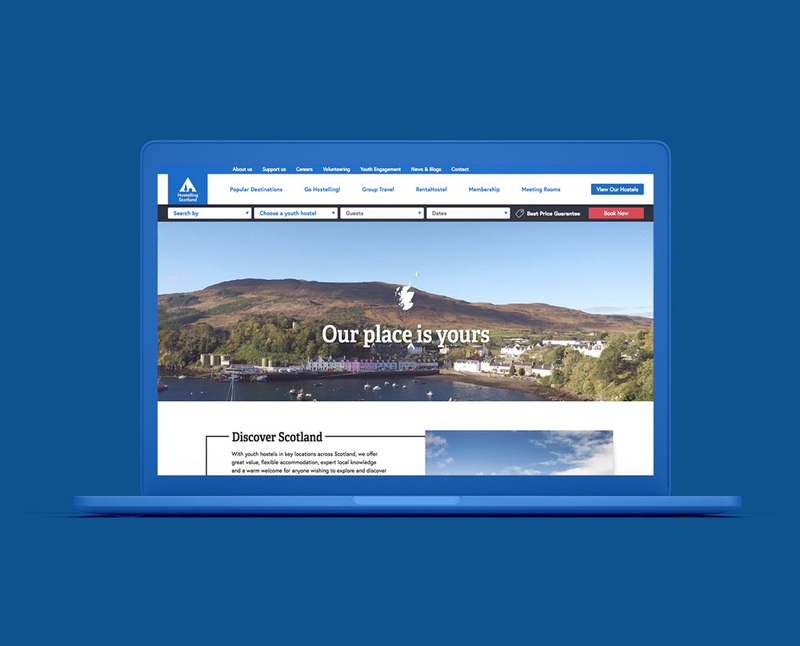 We pride ourselves on exceptional service, offering expert local knowledge and a warm welcome to all those with an adventurous spirit and who wish to experience the real Scotland. We remain true to our ethos and are proud of our charitable objectives, with people and communities at the heart of our organisation. Our charitable youth programmes enable young people to develop their skills for life, learning and work.\"